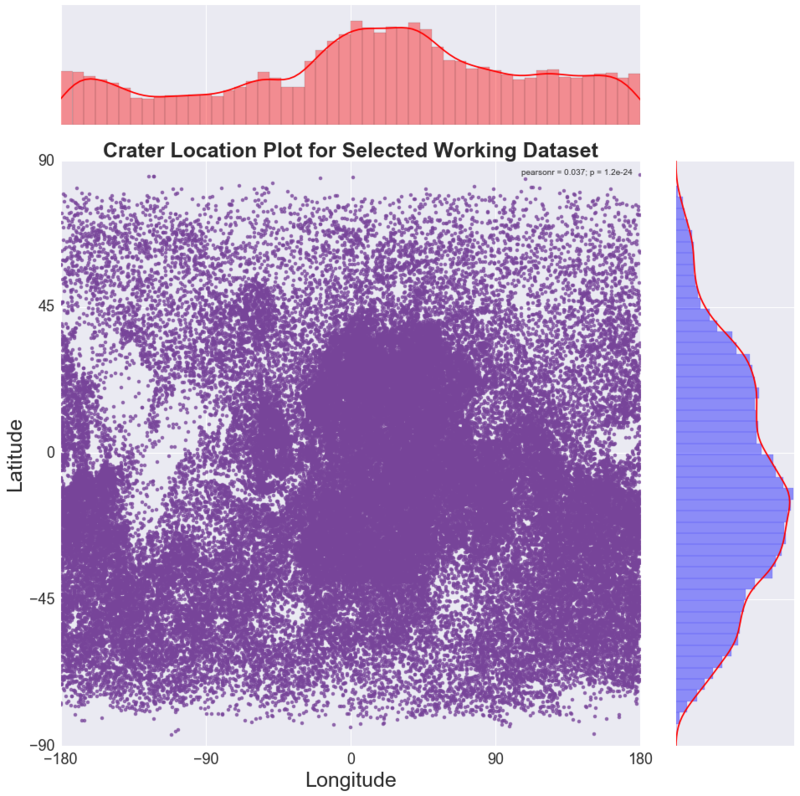 The plot below is a 2D crater location map showing all craters (76,512) in the working dataset created in Week 3. 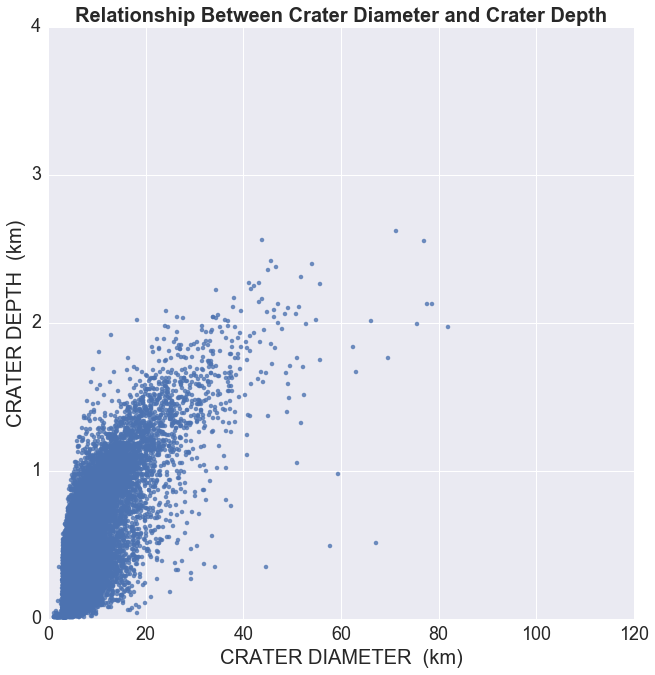 This working dataset includes only craters with diameter greater than 0 and less than or equal to 100km; and depth greater than 0 and less than or equal to 3km. 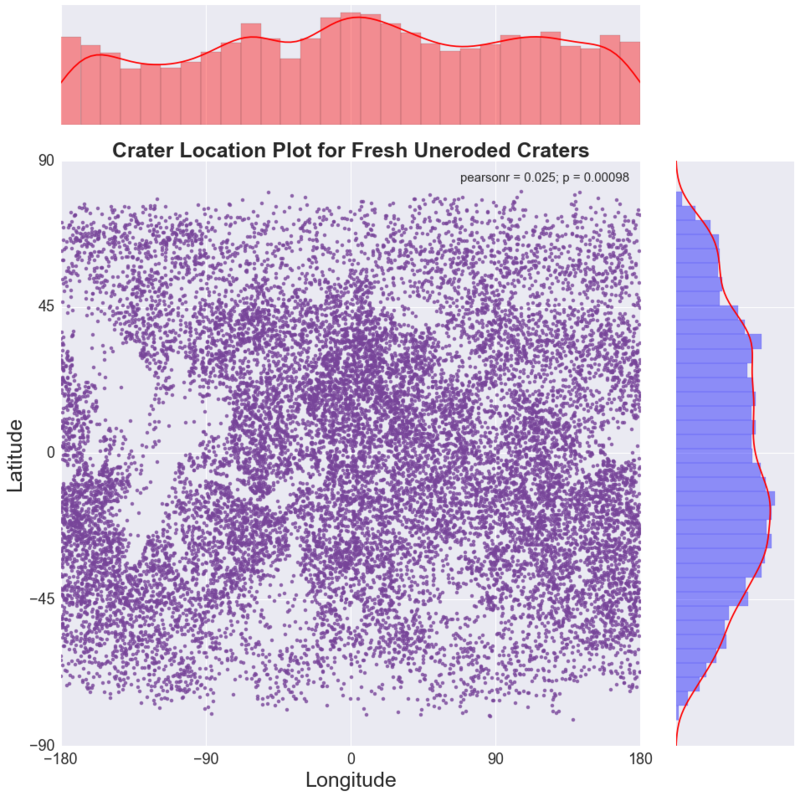 As previously discussed in Week 3, the crater location plot reveals an overall trend in crater occurrence with some well-defined crater clusters. Overall, there are more craters in the southern hemisphere (0 to -90 degrees latitude) than in the northern hemisphere (0 to 90 degrees latitude). Moreover, crater population density increases in the middle of Mars near the equatorial region (-45 to 45 degrees latitude) but decreases towards the tips of both north and south poles respectively. 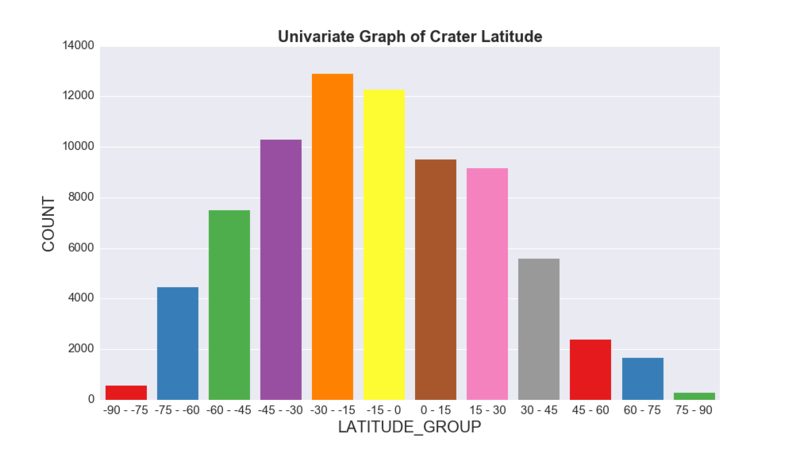 The red histogram on top of the plot shows the distribution of Crater Longitude while the blue histogram to the right of the plot shows the distribution of Crater Latitude. This graph is unimodal with its highest peak at the category of 0 to 0.3 km depth. It is skewed to the right as there are higher frequencies in the lower crater depth groups. This suggests that shallower craters are more abundant than deep craters on Mars. This graph is also unimodal with its highest peak at the category of 0 to 5 km diameter. It is skewed to the right as there are higher frequencies in the lower crater diameter groups. This suggests that smaller (narrower) craters are more abundant than large (wide) craters on Mars. This graph is unimodal with its highest peak at the category of -30 to -15 degrees latitude. It seems to be skewed to the right however the skewness is not pronounced. It also appears to have a semi-symmetrical shape. This suggests that there are higher number of craters near the equatorial region in the middle of Mars (-45 to 45 degrees latitude), than at the North Pole (45 to 90 degrees latitude) and South Pole (-45 to -90 degrees latitude) respectively. Notice that peak crater occurrence is not exactly at the equator but rather slightly to the south of the equator (-30 to -15 degrees latitude). This graph is unimodal with its highest peak at the category of 0 number of crater ejecta layers. It is skewed to the right as there are higher frequencies in the lower number of crater ejecta layers. This suggests that craters with smaller number of ejecta layers are more abundant on Mars. 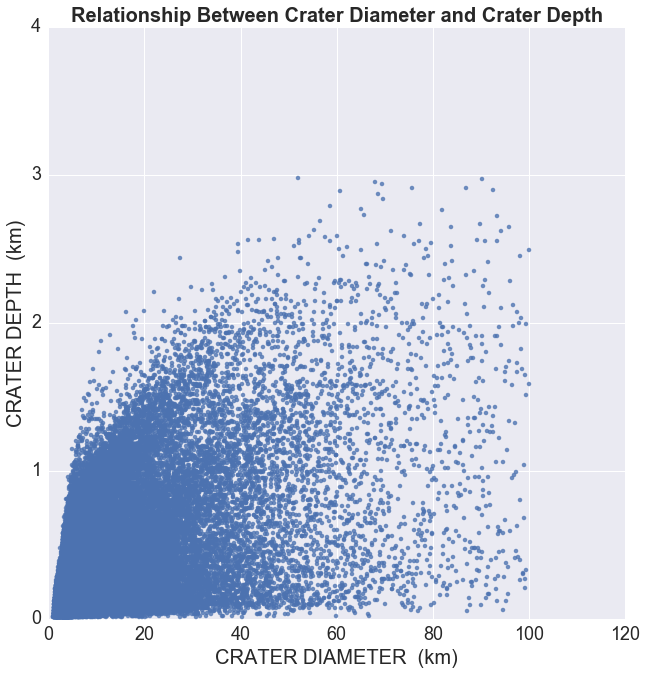 The graph above plots the depth of craters to the diameter of craters. We can see that the scatter graph appears noisy and does not show a clear relationship or trend between the two variables. However, it seems that there could be a positive weak linear relationship between crater depth and crater diameter. 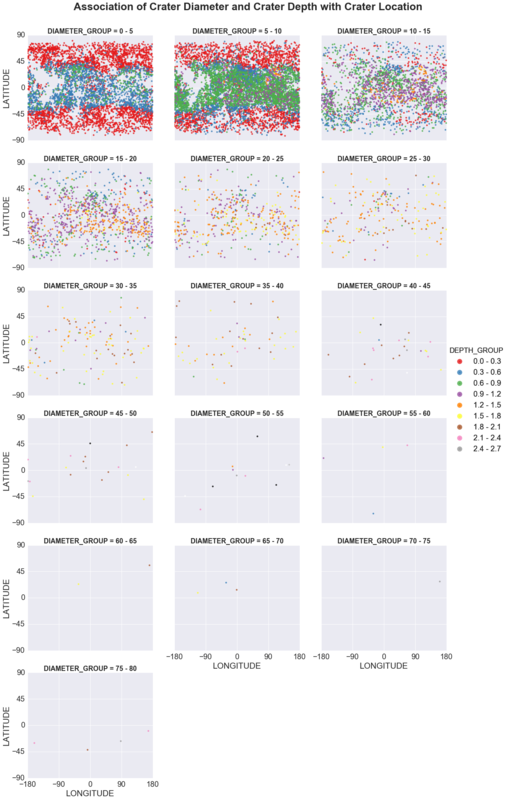 Therefore, I decided to investigate the dataset further, to see if there are other variables which could help reduce the noise and bring out any hidden trend in the scatter graph. The graph below is the result of that investigation. 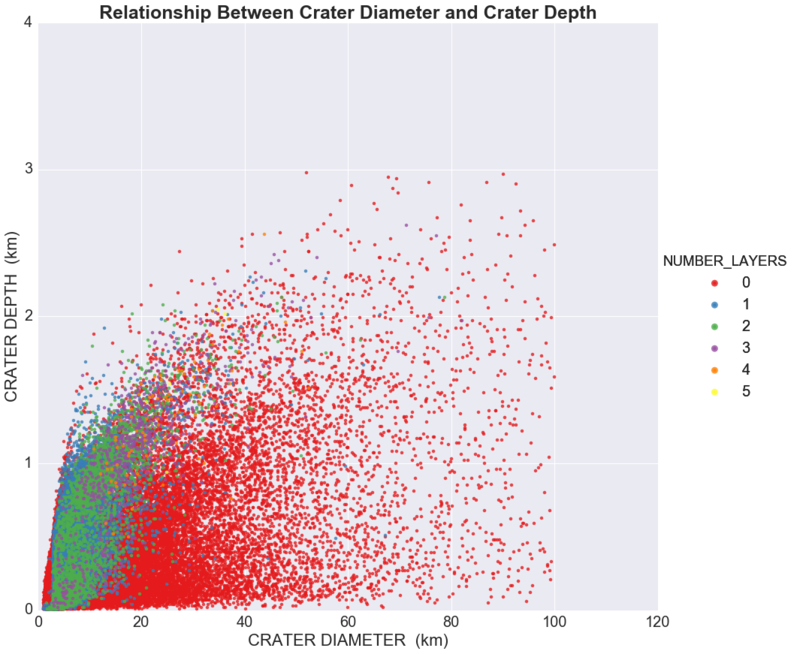 The graph above plots the depth of craters to the diameter of craters, coloured by number of crater ejecta layers. We can see that a beautiful trend has suddenly emerged. 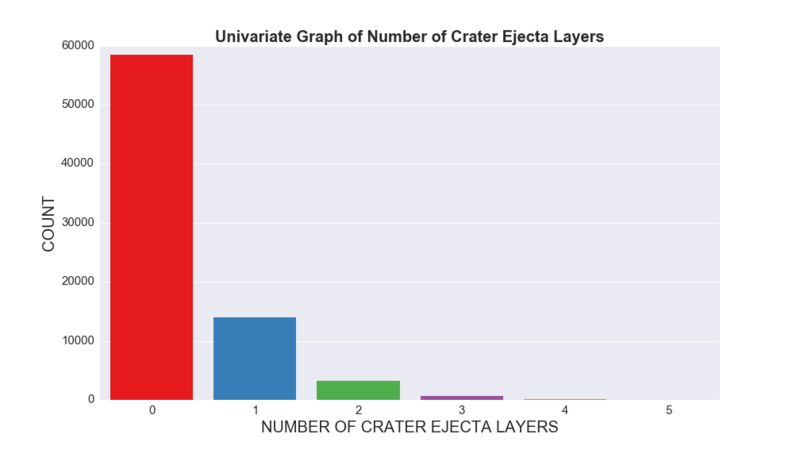 There is a somewhat linear relationship between crater depth and crater diameter for all crater ejecta number of layers except NUMBER_LAYERS = 0. It also appears strange to see that both large craters (crater diameter > 40km) as well as deep craters (crater depth > 1km) have NUMBER_LAYERS as zero. You would expect that such significant craters should have several layers of ejecta. My explanation of this strange phenomenon is that these craters originally had so many ejecta layers, which were later completely eroded away by geological processes occurring on the surface of Mars. I therefore decided to create a new dataset excluding all craters with no ejecta layer, which was called 'Fresh Uneroded Crater Dataset'. 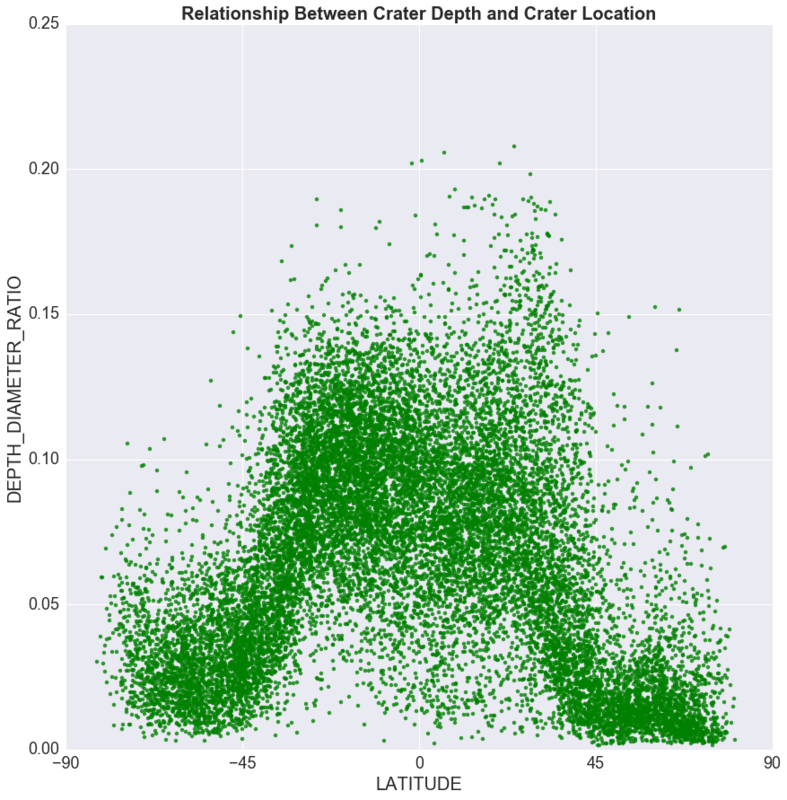 The plot below shows crater depth to crater diameter relationship for craters belonging to this new dataset. 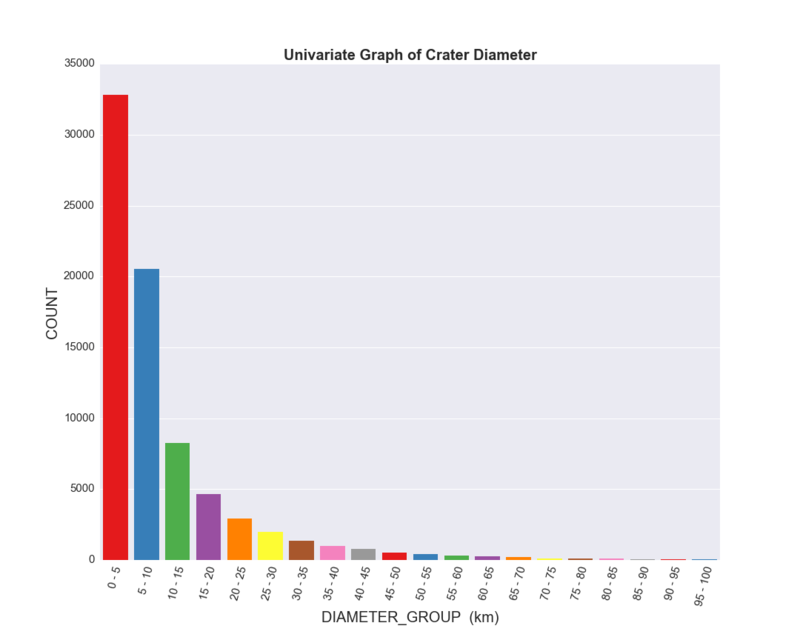 The graph above plots the depth of craters to the diameter of craters for craters with NUMBER_LAYERS > 0. Overall, we can see that crater depth seems to increase with increasing crater diameter. The increase is steeper for crater diameter < 20km but the slope steepness seems to reduce slightly for crater diameter > 20km. Because of this subtle difference in slope with increasing diameter, I then decided to bin the crater diameter variable. The graph below is the result of the binning operation. I grouped the continuous Crater Diameter predictor variable into 100 equal bins in order to reduce the many data points and to allow a clearer trend to emerge. The graph above plots the mean crater diameter for each bin to the mean of the crater depths observed in each crater diameter bin. 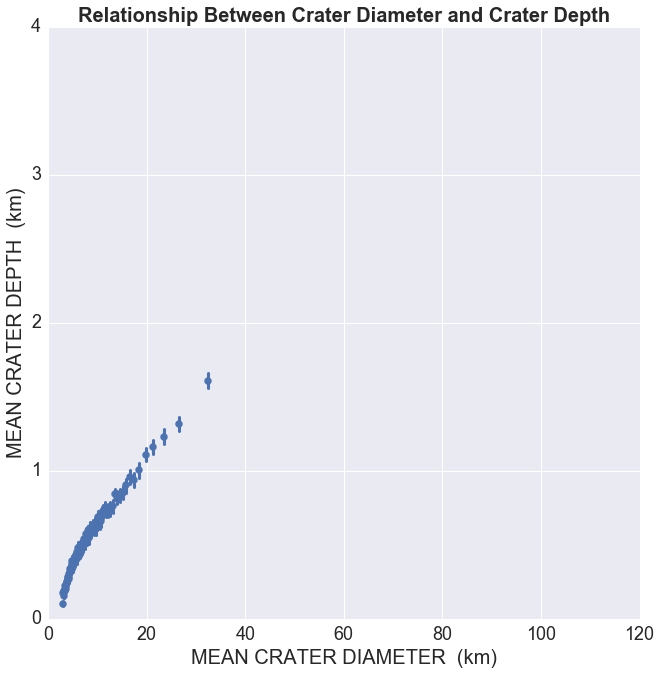 From the above graph, you can see a strong linear relationship between mean crater depth and mean crater diameter when the data points have been grouped. To make this graph more interpretable, it will be good to find another variable which will act as a moderator, thereby making any subtle relationship stronger. Crater ejecta NUMBER_LAYERS variable is a natural choice for a moderator. 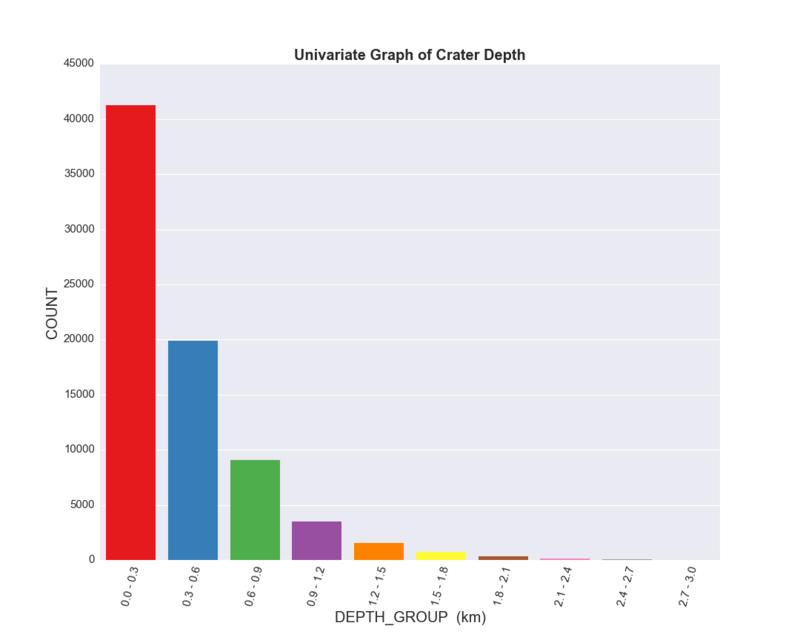 The graphs below show crater depth to crater diameter relationship for craters in each NUMBER_LAYERS category. 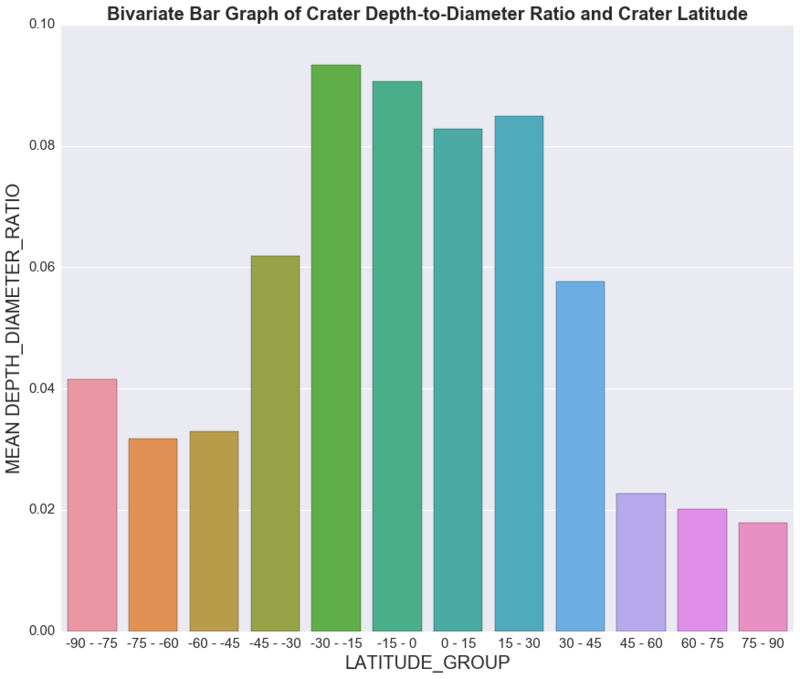 The above multiple graphs show that crater diameter seems to be a better explanatory variable to predict crater depth, when craters are plotted separately in each NUMBER_LAYERS category. The green lines in the graphs are the "lines of best fit". The plot above is a 2D location map of crater latitude and crater longitude which helps to visualize the spatial distribution of the fresh uneroded craters. To answer the research question regarding whether crater depth and crater diameter depend on crater location (latitude), I made a secondary variable called DEPTH_DIAMETER_RATIO (DDR), which is crater depth divided by crater diameter. For a given crater diameter, DDR value will be higher for deep craters and lower for shallower craters. Therefore, in simplistic terms, low DDR values represent craters which are shallow while high DDR values represent craters which are deep. From the above graph, you can see that low DDR values occur mainly at the South Pole (-45 to -90 degrees latitude) and North Pole (45 to 90 degrees latitude). Higher DDR values occur predominantly in the middle of Mars (-45 to 45 degrees latitude), near the equatorial region. This implies that shallow craters occur mainly at the North and South Poles while deeper craters occur mostly around the middle of Mars (near the equator). The graph above is a bivariate categorical to quantitative bar graph which provides a similar picture to the scatter graph above. The Y-axis represents the Mean DDR of each Latitude_Group category plotted on the X-axis. The North and South poles have low Mean DDR values while high Mean DDR values are concentrated in the middle of Mars. 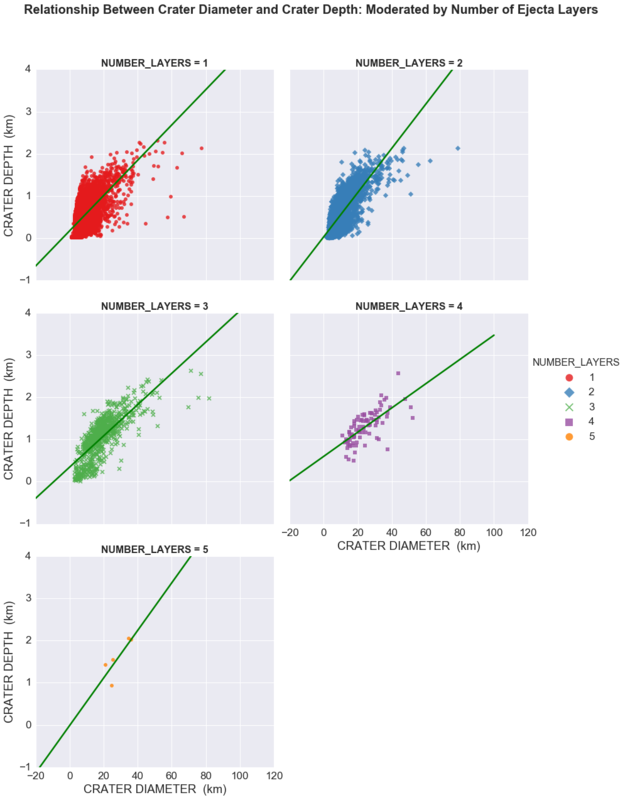 The modality of the distribution is not very pronounced. Although the graph has a subtle bimodal appearance, however I would rather say it is unimodal with a broad top and highest peak at the category of -30 to -15 degrees latitude. The Mean DDR distribution also confirms that shallow craters occur mainly at the Poles and deep craters near the equator for a given Crater_Diameter group. This observation and conclusion becomes clearer in the spatial location plot below. The objective of the above joint multi-graphs is to present a visualization panel describing the relationship between crater location (latitude and longitude) and crater depth and diameter, separately for each Diameter_Group. The graphs are plotted separately for each Diameter_Group but marked with different colours according to Depth_Groups . The above graph clearly shows that deep craters occur predominantly in the middle latitudes of Mars (-45 to 45 degrees) while crater occurrences at the Polar Regions are mainly shallow types for any given Diameter_Group. The graphs also show that dense crater occurrences are more widespread across Mars for small and intermediate Diameter_Groups (0 to 5km, 5 to 10km, 10 to 15km and 15 to 20km). However, as diameter increases, crater occurrences are more restricted to the middle latitudes of Mars. Very deep and wide craters occur mainly in the middle latitudes of Mars (-45 to 45 degrees). Any crater found in the North Pole (45 to 90 degrees latitude) or South Pole (-45 to -90 degrees latitude) is most likely very shallow and narrow / small. The observed relationship between crater location (latitude) and crater depth / diameter suggests that Martian soils are softer near the Equatorial Regions and harder at the Polar Regions. This may be due to the presence of polar ice and other differences in mineralogical composition. In conclusion, if I should lead an expedition to Mars in search of life or best location for settlement, I will land my spacecraft in the middle of Mars, around the equator rather than the Polar Regions. First part of week 4 assignment.